The state of the economy is in the News every day with layoffs and unemployment figures escalating. It has caused stress on charitable and non-profit groups who exist to help needy people. One is our local ACTS (Area Churches Together Serving) that has been in existence for about 20 years. It is a coordinated effort by churches in our community. The schools help with their annual Canathon. ACTS is a place for persons needing food and clothes to go. It is located on Greensboro Hwy at the Oconee Government Annex. A number of persons have worked there over the years. At this time, two fine members of my church, Gene Veal and Reiny Hiss, have made me and others aware of the needs. Recently, the group held an emergency meeting at Watkinsville First Christian Church to discuss the situation and map a strategy. New appeals are going out to participating churches.Information about ACTS appears below. SOME IMMEDIATE NEEDS IN FOODS: Soups, Canned Meat, Oatmeal, Grits, Chicken and Beef Broth, Peanut Butter and other protein foods. Two other favorite charities that I have worked with and do work with now are IHNA (Homeless) Interfaith Hospitality Network of Athens, Inc. and All God’s Children, Inc. (Special Needs Adoption Agency). Both of these agencies are feeling the stress of the slower economy. Both could use financial help and volunteers. Information about both appears below. Please look at the information below and visit the websites and help both of these worthy causes. ACTS has served Oconee County for over 20 years. It is located in the Government Annex on Hwy. 15 in Watkinsville and is staffed by volunteers from area churches. ACTS operates with cash and food contributions from local churches, individuals, clubs and civic organizations but the main source of donations come from the annual school Canathon each December. Any monetary and/or non-perishable food items for ACTS always are appreciated. Donations were down significantly in 2008, even after receiving over $ 21,000 and over 30,000 cans. In addition to assisting with food needs, ACTS also has a small clothes closet where families have access to clothing, linens, and miscellaneous household items. Referrals for families are made to ACTS by churches, DF ACS, and ACTION, Inc. There are many opportunities to assist ACTS by receiving, sorting, and restocking shelves with food and clothing as well as preparing and distributing food baskets. ACTS is open from 9:00 a.m. to 1:00 p.m. on Tuesdays and Fridays. The A CTS Annual Meeting, held on February 4 at Watkinsville First Christian Church, was well attended with over 45 people being present. A new board of directors was appointed and plans for this year were made. One goal for 2009 is to have at least six more churches committing to support ACTS. Until that happens and due to the increased number of families being served, they are currently understaffed on Tuesdays and Fridays. If you would like to volunteer to help out on days other than when our church is scheduled to staff the facility, please see or call Reiny Hiss (706-559-4559). Just as a reminder, our church will staff ACTS on the fourth Friday of March, May, July, and September. What does IHN of Athens do?. Our organization helps families in need with the only requirement for admission into the network being that the family has children with them and is homeless. Through February 2007, IHN of Athens has provided care for more than 120 individuals, including 70 children. During the day, if the families are not working, at interviews or at school, they reside at The Day Center, which is the main headquarters of IHN of Athens. 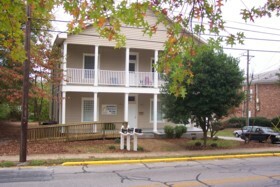 This facility is a historic home owned by First Baptist Church of Athens, and is a place our guests can use as a mailing address and phone number. The building also offers showers and laundry facilities. At nights, guests stay with one of the host congregations. Host congregations rotate on a weekly basis, operating from Sunday to Sunday as a place of shelter for our guests. It is at these congregations where volunteers provide meals, transportation and lodging for our guests. All God’s Children was incorporated in 1997 in an effort to provide more adoption opportunities for the children who wait. Our focus is on the children who wait longest for families. We are committed to increasing awareness in Georgia about the need for adoptive families. We provide an intensive process of preparing families to adopt older children, help match families with waiting children, and provide close support to families after a child is placed in the home. All God's Children, Inc. works in partnership with the Georgia Department of Human Resources to find families for Georgia’s waiting children. All God’s Children also assists in the placement of waiting children in state custody elsewhere in the United States.